Yes! I will pass your information along to Geoffrey Rockwell and Melissa Terras, who are handling print distribution. Thanks for your interest and for spreading the word! I really like your posters! We are slowly starting to support DH projects with the library at uOttawa. I was wondering if we can purchase the two posters you have on this page? Thanks for your interest! We unfortunately don’t have any print posters at this time, and we aren’t set up to take payments for them. We recently gave away just over 100 copies and are now out of stock. Stay tuned for future giveaways, which we will announce on the site and via our Twitter account, @4Hum. You can also download a PDF copy of the infographic in the post above and print one out for yourself (it is quite long though – over 80 inches). great infographic. i’d love to blog about this, but i’m not seeing a link to use to embed the infographic into my blog entry, and reading in the pdf doesn’t seem to be a good solution. tips? 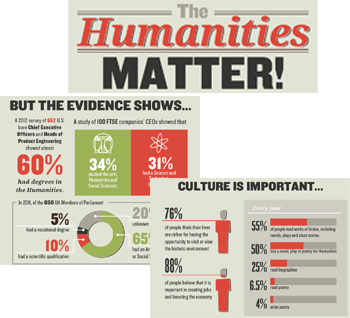 Pingback: Here are 9 reasons why humanities matter. What’s your number 10? Would it be possible for you to provide a pdf with page breaks, so that this information could also be printed out on 8.5″ x 11″ paper? Thank you in advance for your reply.